NATO member states should expel Turkey from membership unless, it withdraws its troops from Syria. To secure the northern border, the UN could offer the immediate deployment of troops to Afrin, which could be extended to a Grand Bargain for other opposition-controlled areas. This deal would have to include Russia. 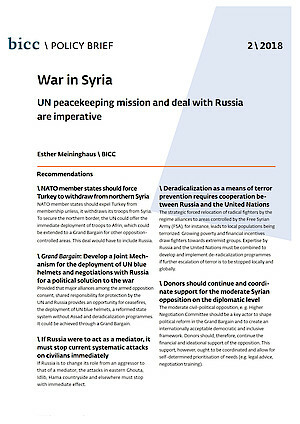 Provided that major alliances among the armed opposition consent, shared responsibility for protection by the UN and Russia provides an opportunity for ceasefires, the deployment of UN blue helmets, a reformed state system without Assad and deradicalization programmes. It could be achieved through a Grand Bargain. If Russia is to change its role from an aggressor to that of a mediator, the attacks in eastern Ghouta, Idlib, Hama countryside and elsewhere must stop with immediate effect. The strategic forced relocation of radical fighters by the regime alliances to areas controlled by the Free Syrian Army (FSA), for instance, leads to local populations being terrorized. Growing poverty and financial incentives draw fighters towards extremist groups. Expertise by Russia and the UN must be combined to develop and implement de-radicalization programmes if further escalation of terror is to be stopped locally and globally. The moderate civil-political opposition, e. g. Higher Negotiation Committee should be a key actor to shape political reform in the Grand Bargain and to create an internationally acceptable democratic and inclusive framework. Donors should, therefore, continue the financial and ideational support of the opposition. This support, however, ought to be coordinated and allow for self-determined prioritisation of needs (e.g. legal advice, negotiation training).